Over the weekend, I spent a full day at a client's house regulating his beautiful Bösendorfer grand piano. What the heck IS regulation, do you ask? To be honest, when writing the copy for this very website, I struggled coming up with a definition for regulation more than any of my other services. Part of that is because although it is a critical part of what allows a piano to feel and sound its best, regulation is just not something most people have heard of, kind of like my sister's former job title of "actuarial analyst". But it's also because there's way more to it than what my distilled one sentence definition of "adjusting the many parts of the playing mechanism, called the action, in order to make the touch consistent and optimally responsive" implies. Back in June of 2004, I moved 2,782 miles from Ithaca, NY to the Portland, OR area to attend School of Piano Technology for the Blind (formerly the Emil Fries School of Piano Tuning and Technology), colloquially known as the Piano Hospital, in Vancouver, WA. A year later in 2005, in what is to this day one of the wackiest coincidences of my life, Casey Harris made the same journey from Ithaca, NY and joined me as a fellow piano tech student. Now a bona fide rock star as the keyboard player for the hit band the X Ambassadors, Casey no longer tunes pianos for a living, but is on the road for what seems to be 362 out of 365 days of the year, touring and performing with his band. This past weekend, in Portland for a show headlining the Widmer Brothers Oktoberfest in downtown Portland, Casey and his brother Sam, the lead singer of the band, generously detoured (ha! puns) to the 'Couve for a few hours to perform as part of a benefit show for the Piano Hospital. 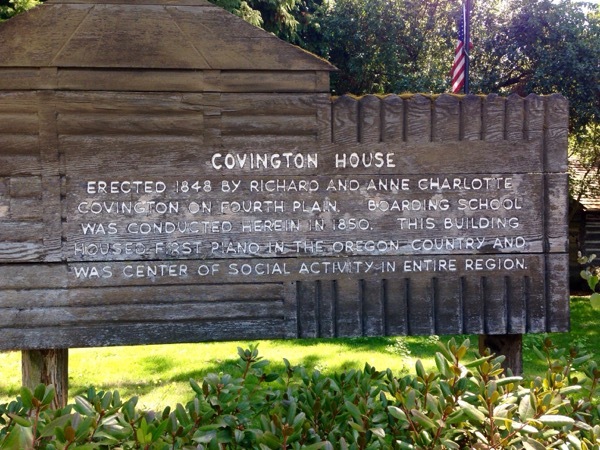 I was out and about today and walked by the Covington House, a historic log cabin situated a bit north of downtown Vancouver, WA. Lo and behold, what did I discover when I read the placard in front of the building? That it apparently "housed the first piano in the Oregon Country." My inner piano nerd was delighted upon making this discovery. It's amazing what you discover when you stop to read historical anecdotes every now and then. Note: Piano Adventures is a regular feature highlighting the quirky aspects of my daily life as a piano technician, from the paradoxical challenges of working with inanimate objects to the characters I meet. A couple of weeks ago, I was tasked with teaching someone how to replace a broken piano string. Piano wire is quite stretchy, a fact a lot of people are not aware of because most people never have a reason to experiment with stretching steel. When a piano is at its designated tension, a piano wire is generally at 60% of its tensile strength. So, theoretically, if a piano is well-maintained at the proper pitch, a string should never reach the 100% point at which it will break. However, “should not break” and “will not break” are not the same thing.